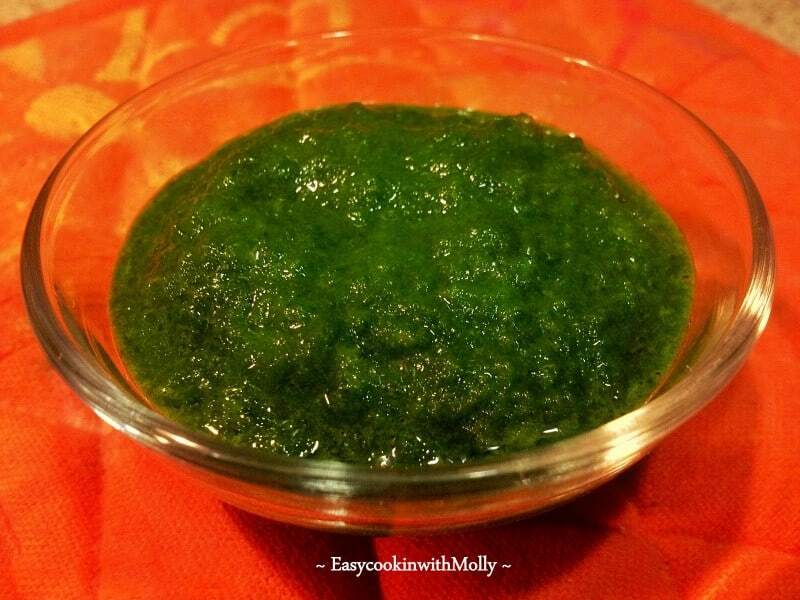 Mango Cilantro Chutney is an extremely popular and traditional Indian style sweet-tangy chutney. It’s also known as Coriander chutney. 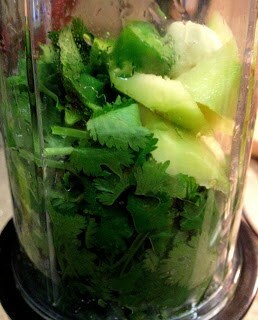 Mango Cilantro Chutney is made using raw-mango along with fresh cilantro or parsley along with few spices. This can be stored in the fridge in an air-tight jar upto 2-3 days. “Mango” is called King of Fruit’s” in many parts of India, it’s only available in summers and as the temperature rises, we get more sweet & ripe varieties of mangoes. This Mango Cilantro Chutney marks the beginning of mango season in north India where many stores/foot vegetable vendors carry green raw mangoes. Although coriander chutney can be made without the mango as well, with mango, it just tastes more tangy & divine. The Mango Cilantro Chutney can be used as “Dip” with savory snack items OR can be poured over many other entrees/appetizer to enhance the flavors. Serving Suggestion: Can be served savory snacks/food OR Can be used in sandwiches. Storage: Can be stored in the fridge in an air-tight jar/container for 2-3 days. In a hand blender jar, add all the above-mentioned ingredients (pic2)and blend to a smooth paste. (It should be a thick consistency). Serve Fresh OR Store in an air-tight jar and refrigerate for 2-3 days. Mango Cilantro Chutney - is an extremely popular and traditional Indian style sweet-tangy chutney made using raw-mango along with fresh cilantro/parsley. In a hand blender jar, add all the above mentioned ingredients and blend to a smooth paste. (It should be a thick consistency). 2 Replies to "Mango Cilantro Chutney (How to make Indian cilantro mango chutney)"